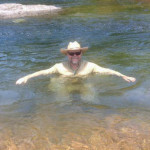 Two days on the White River with outfitter/philosopher Miles Riley is what Arkansas trout fishing is all about. 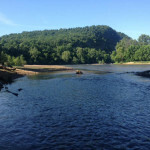 We put in Wednesday morning at Rim Shoal and floated down past Shoestring Shoal to Riley’s Station where the Buffalo River meets the White, catching rainbows and a few cutthroats all the way. I don’t count fish but we must have boated and released at least two dozen. 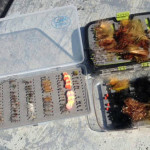 Tandem rigs with pink San Juan worms, #20 bead head Prince nymphs, (pardon me…the nymph formerly known as Prince), or black #18 zebra midges worked all morning. We found some shade and ate our shore lunch (‘cause we shore were hungry), then continued down river. The fish didn’t mind the 90-degree midday heat and the bite stayed good all afternoon. We called it quits at 4PM while I still had enough energy to drive back to Mountain Home. 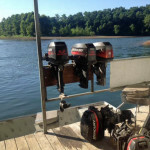 Next day we motored upstream past towering bluffs on the left and stopped at Buffalo Shoal where we stayed all day. With action like this, why leave? We added something new to the arsenal: a midge developed by Steve Hegstrom called a Scarlett O’Hare. With this and the San Juan worm I proceeded to boat and release about 40 or 50 rainbows and cutts. 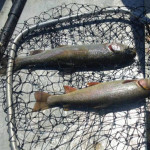 The Hegstrom nymph was getting pretty ragged by mid afternoon so we traded it for a little gray bead head scud – Miles just called it his Guide fly – and continued to catch trout including several measuring between fifteen and seventeen inches. 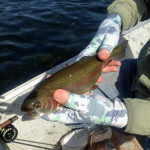 On one cast I hooked and landed a cutt and a rainbow, one on each fly. Then several casts later it happened again but this time one fish threw the hook before being netted. It’s hard to beat trout fishing like this. If you want to go, contact Miles or Michelle at http://www.rileysstation.com . 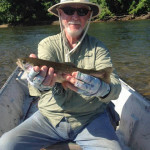 This entry was posted in Fishing, Outdoor Sports and tagged Arkansas, trout fishing, White River by BruceCochran. Bookmark the permalink.